Best Jo Chen cover yet. The likenesses are amazing, even though they are from the side. The waves, the storm, clouds, everything about is great. I really love the style of the TPBs and can't wait to pick them up. A lot easier to display then the single issues. Best Jo Chen cover yet. The likenesses are amazing, even though they are from the side. Ehh... I don't know. 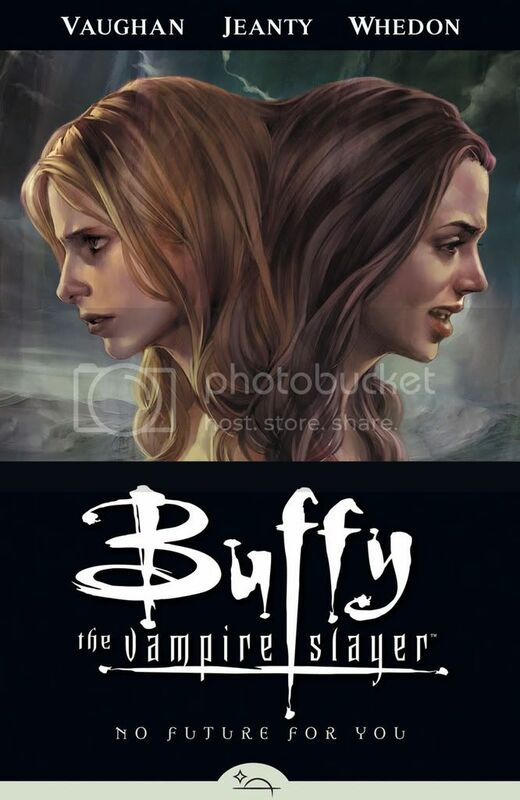 Yeah, Buffy looks great, but I'm not loving the Faith likeness on this one (it's something about the mouth--the area around her eyes is fine). Jo Chen did a better job with her on #6 and #9, I think. These covers just keep getting better and better. Unbelievable. I don't think I've ever seen such gorgeous work. Amazing! I love the artwork on this one. Beautiful. I agree that this is the best art yet. This makes me to excited! V.V! I want them to all come out now! I've broke and will be picking up all the issues and all the TPBs... I mean, how can I not? I love how dark this cover looks, totally Faith. I will be putting all of my comics in storage boxes and displaying the Season 8 TPBS with my Buffy and Angel series boxsets as well as the Fray TPB. All canon! I will do the same with Angel: After the Fall when it is released in TPB form. The cover looks mega. Great work. They just kep getting better and better. Just have a problem with Faiths mouth. I really like this cover! Great likenesses! But I plan to buy the single issues. The cover is great, but for me, I can't wait until January or probably later for this! I swear I already posted in this thread! LOVE IT! I can't wait to replace the single issues with the TPBs. Part of my strongly dislikes the single issues. The staples, the flimsy pages and especially the many many ads. I hope there are some cool features also. I love this cover, it is absolutely stunning. Jo has done it again with perfection. Jo is amazing. I wish I had a little Jo in me. Did the first TPB come out yet? I think its out in November, but I could be wrong. You're right. November 14. I'm counting down the days.